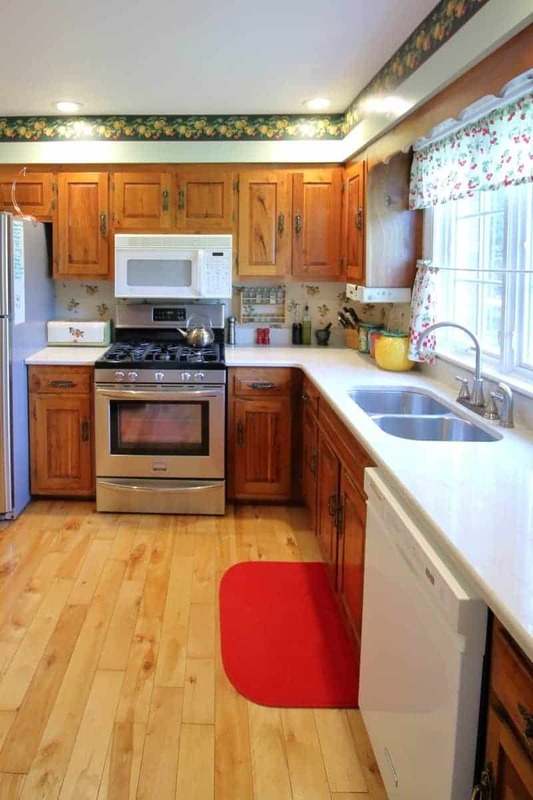 You are here: Home / Interiors / Mini Kitchen Remodel Part 2 – It’s Done! 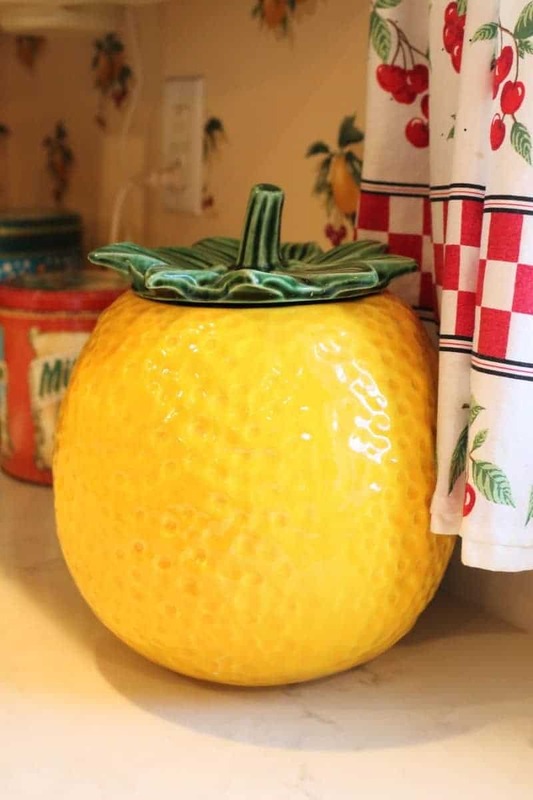 Mini Kitchen Remodel Part 2 – It’s Done! We completed a mini kitchen remodel rather than a full blown renovation to update our home. Remember how cool the Brady Bunch house looked when you were a kid? (I watched it in re-runs, so I’m not THAT old, but if I am dating myself, just keep it to yourself. K?) Funny thing, though. Watching it as an adult, it’s anything but cool. The colors?!? 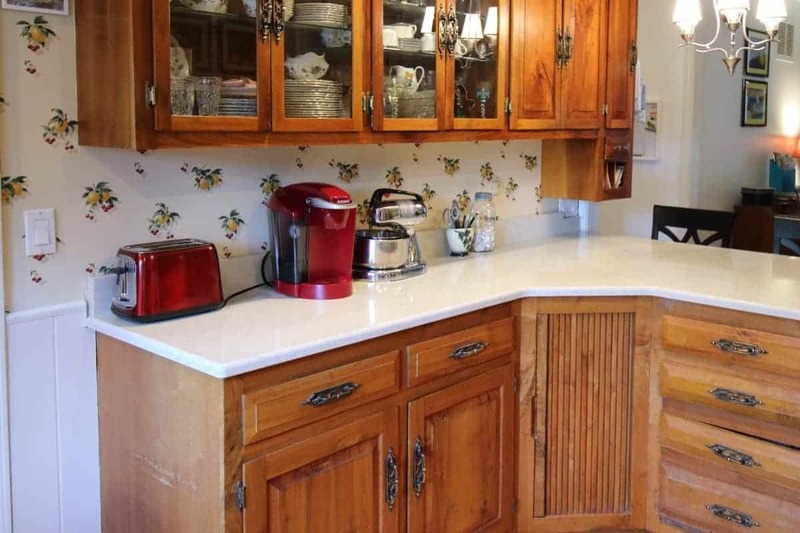 They had burnt orange counters, with avocado and dark wood cabinets. Truly cringe-worthy. 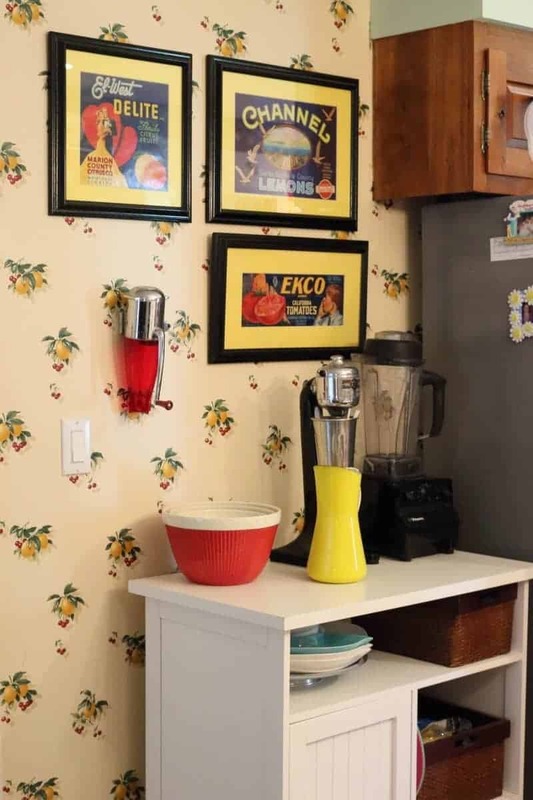 Unlike the Brady Bunch house, where avocado green was used as an accent color, our entire kitchen was green. Floor, counters, light, and appliances – all avocado green. Over the years, we’ve removed almost all of it. Except for the counters. You can check out my post Mini Kitchen Remodel Part 1 – Out with the 1970’s Avocado Green Counters! for more pictures and details, but this picture will give you an idea. The camera doesn’t really capture the true color – it’s actually much deeper, and looks more like the shade of an olive. 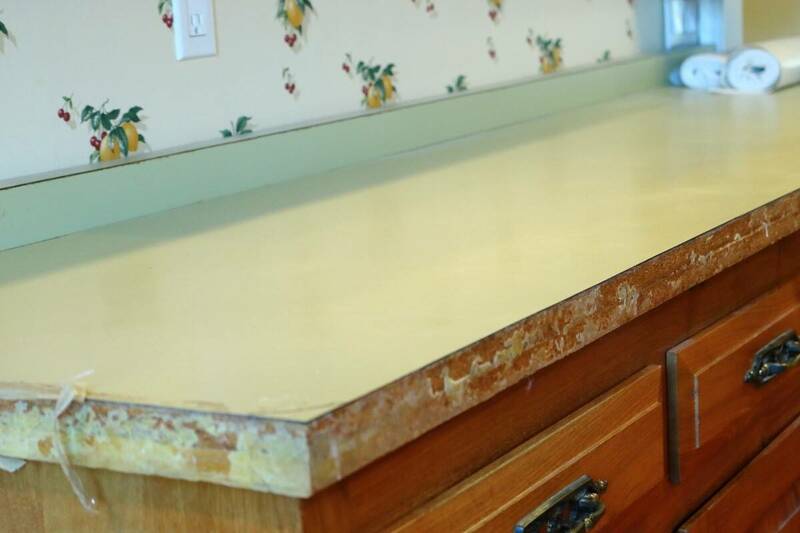 Despite the peeling edges, these plastic formica countertops were indestructible. Trust me. We tried! 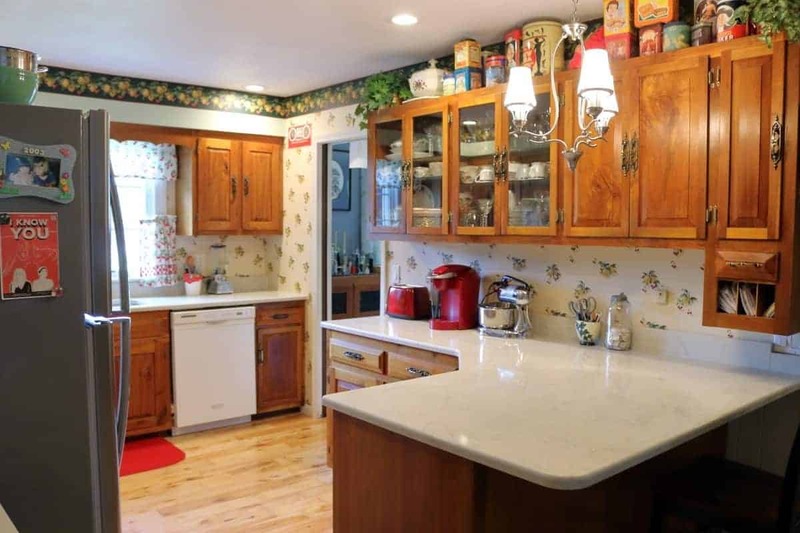 This kitchen remodel was small in scope: install new countertops, repair and paint the ceiling, and replace the recessed lighting trim rings. 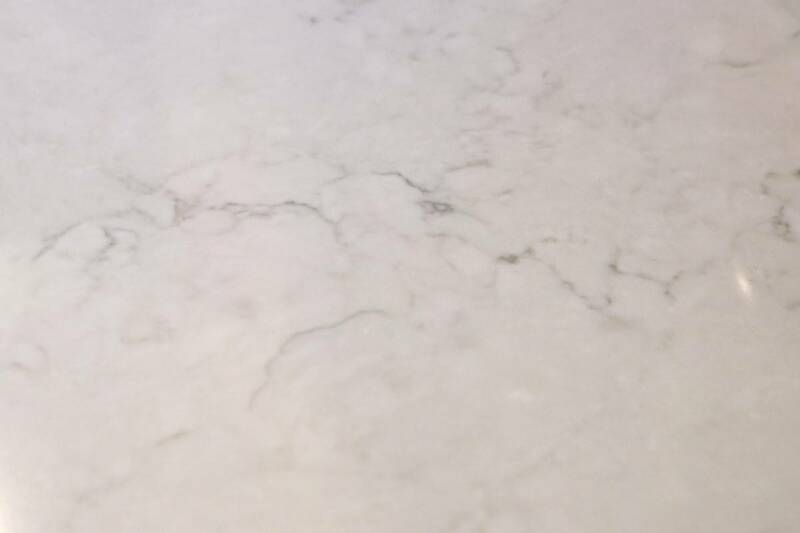 The quartz countertop is Vicostone Crema Chiffon (it’s almost the negative image of the counters in our bathroom remodel). I like that it has veining like marble, but it’s very subtle. 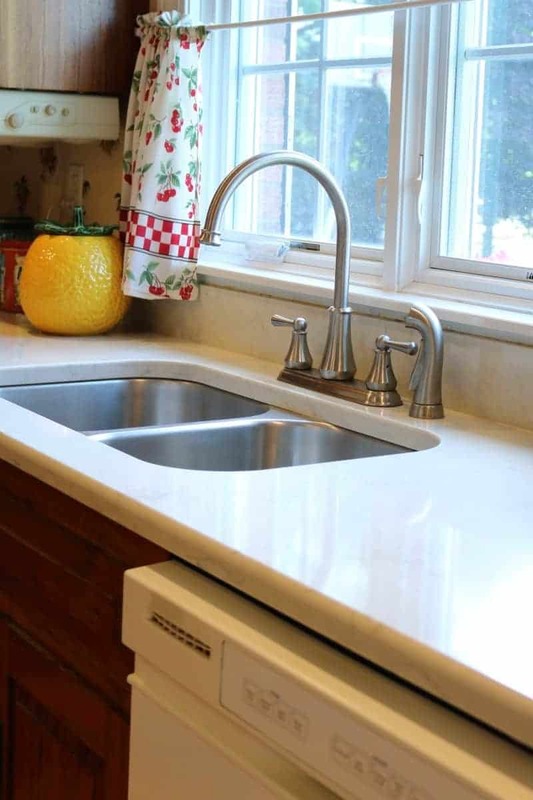 We chose a quartz countertop for it’s durability and because it doesn’t need maintenance like granite or marble. We also wanted something light since the room faces north, and we were keeping the wood cabinets and floor. 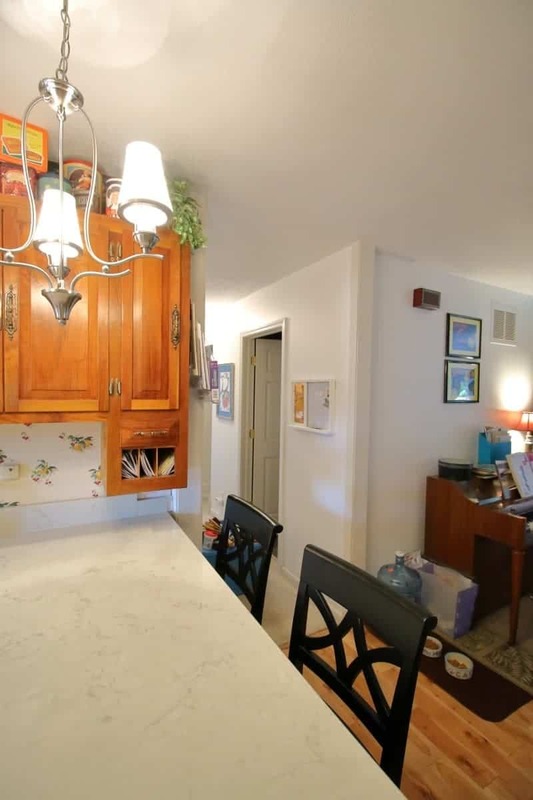 The kitchen does not have a ton of storage space, so a lot of stuff gets stored on the countertops. 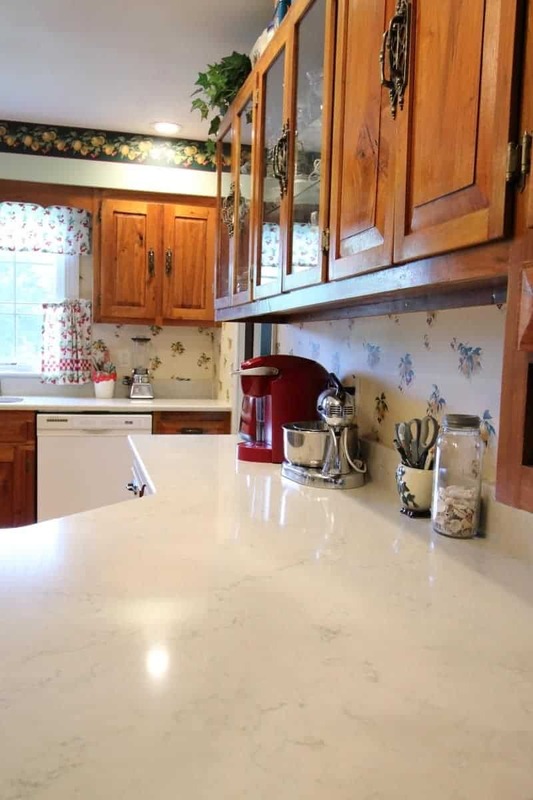 Because of this, we decided to go with a simple 4″ tall backsplash made from the quartz. It didn’t make a lot of sense to install a tile backsplash that you would never see. 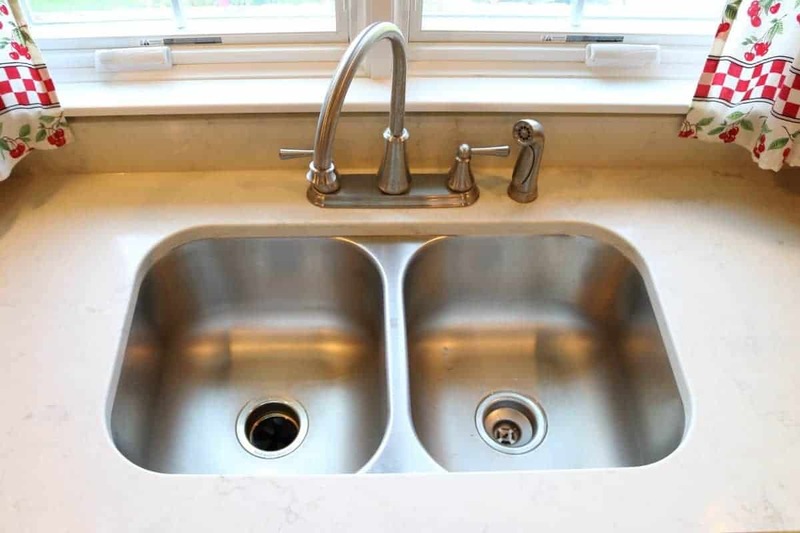 The stainless steel undermount double bowl sink is super deep, and was pre-installed by the countertop manufacturer. 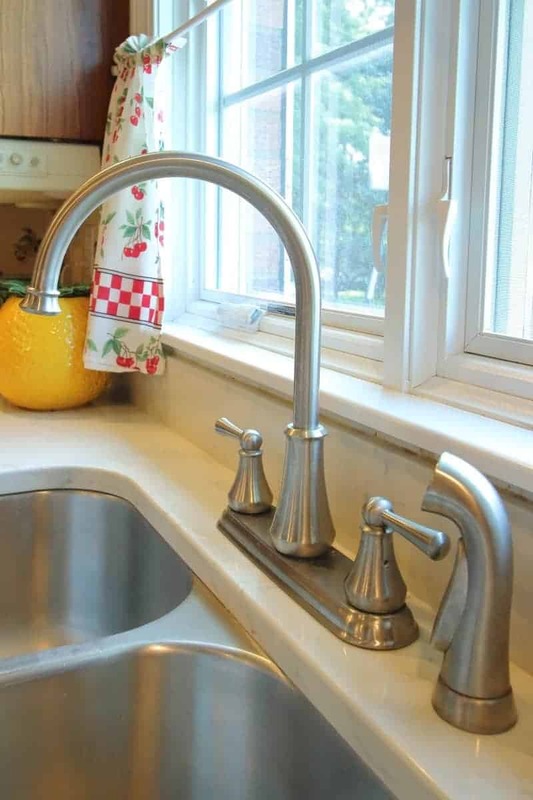 We installed a new Delta Lewiston Kitchen Faucet as well. We had a contractor repair the ceiling, so that it’s all one texture (it used to be three different ones) with no patches. He applied a light knockdown texture to the whole area, which matches the rest of the house, and then painted the ceiling. The four recessed can lights needed new trim rings because the old ones had rusted. 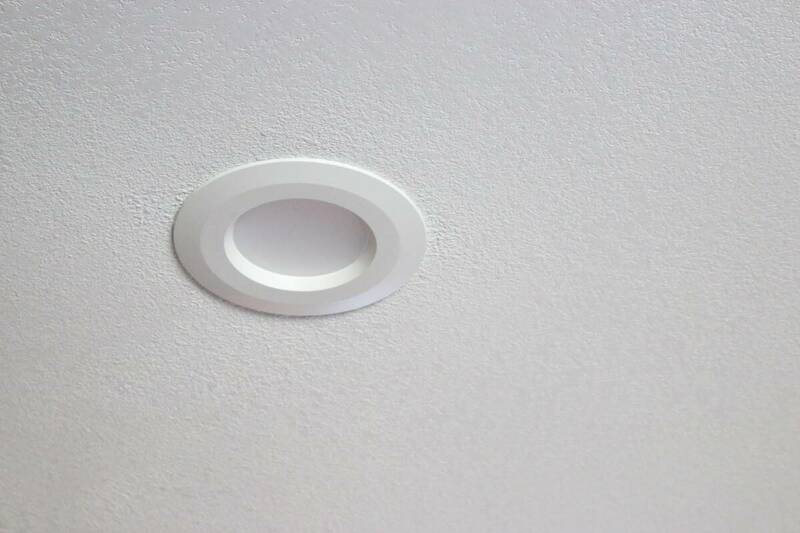 We found these awesome Commercial Electric White Integrated LED Recessed Trim that were soooo easy to install. Plus, they look great and provide a lot of light. Check out this short video to see how quick and easy they are to install. When we started this project, I knew that I only wanted to get rid of the avocado green counters and not do a full blown remodel. I have a thing for vintage advertising and retro designs – I love the graphic style and the colors – and I wanted to keep my retro kitchen. 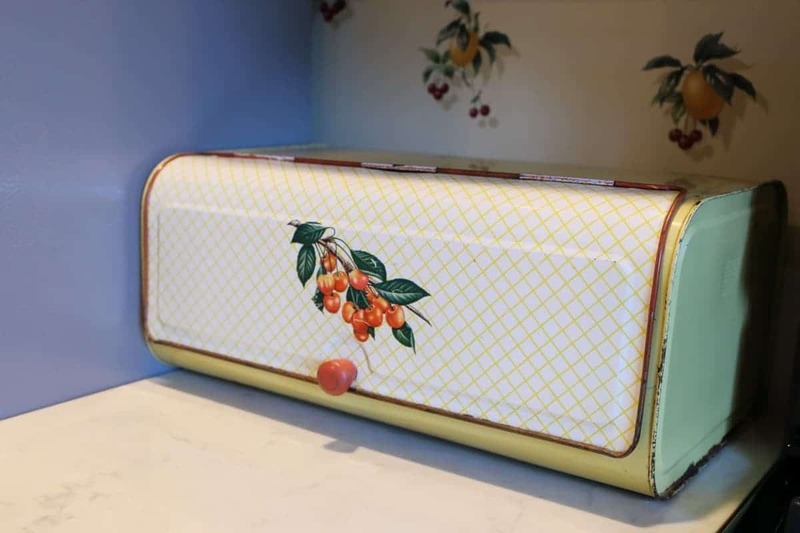 I hung this retro lemon and cherry wallpaper a long time ago (longer than I probably want to admit! ), and it’s the basis for the decorating theme, so it was staying. The door down the hall is our newly remodeled bathroom (which was completely 1970’s Harvest Gold). Since we now have such a nice breakfast bar, we ordered these Paulette Bar Stools from Wayfair. Super cute and easy to assemble. 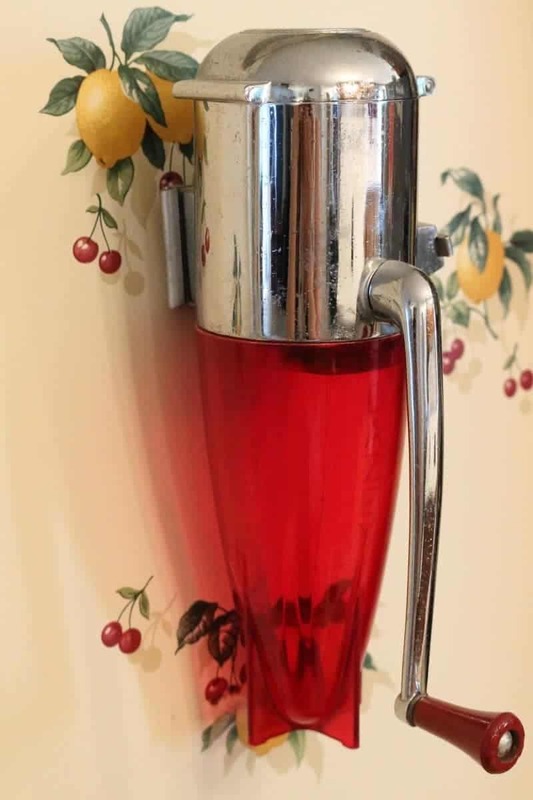 Here are some of our vintage kitchen accessories. I love, love, love the counters!! Thanks!! We should have done this a long, long time ago. ?